The powerful combination of high quality science, an entrepreneurial culture, and strong partnerships between UCSF’s investigators and experienced team has resulted in an impressive track record of commercial successes. Our team will work with you to evaluate new technologies, guide you on strategies to support commercialization of your idea, and devise a tailored commercialization and IP protection plan. 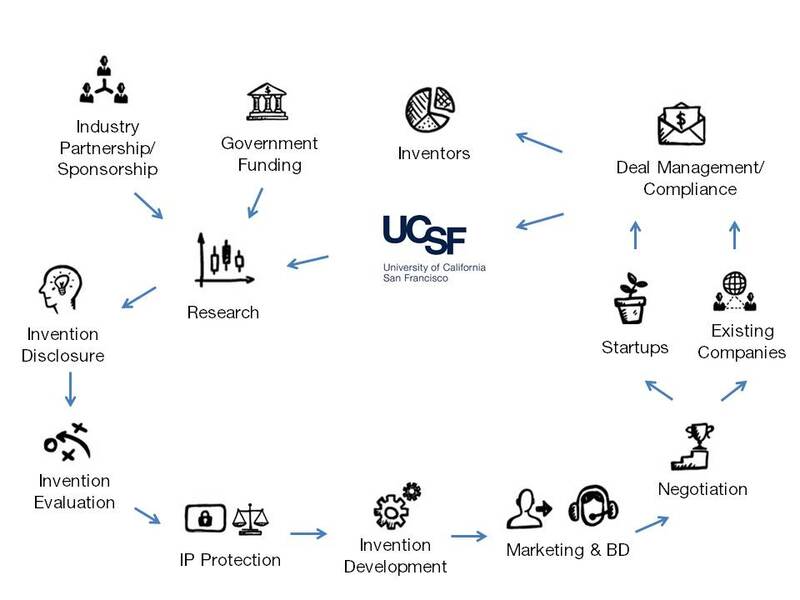 Let's take a closer look at the process of commercializing UCSF's inventions from the lab to products that impact lives! Resources to help you advance your program, whether a software developer, an engineer to build a device prototype, or a contract lab to test pharmaceutical properties of your small molecule. These are just a few ways we can help you grow your idea. Whether you need help finding funding, or development partners, or gaining strategic planning input, you can always contact us: we’ll work with you and connect you to the resources you need to be successful. If you have an invention or technology that you think is new, exciting and has potential as a commercial product or application, please contact our office. Click Here for more information. There are several factors we consider when we evaluate your innovation and you, as the inventor and expert in your scientific area, remain critical in aiding this process. What is the product and its commercial need? Will a company need exclusivity to commercialize this innovation? IP Protection Necessary to Protect the Technology? Is it a therapeutic, diagnostic or device? Is it a software product, app or copyright? Is it a research tool, such as a transgenic model, cell line or non-therapeutic antibody? As a general rule, products requiring significant financial input before they reach the market will benefit from patent protection. Examples include therapeutics, diagnostics and devices. Software and apps are already protected under copyright law. Research tools have inherent property rights and therefore rarely require patent protection for successful commercialization. In addition, Click Here for an interactive course of patents, copyright, trademarks and trade secrets. Is funding available to move the product to the next stage of development? What work is needed to further validate the technology? Some Factors Considered by Companies when Deciding Whether to Take a License to a UCSF Technology? Legal issues, such as ownership of the product, need to license additional rights from a third party, etc. If the inventor is interested in starting a company to develop the technology. Working closely with the inventor(s), our evaluation process results in the generation of an IP protection and commercialization plan, with an eventual goal of licensing the technology to an external partner. Once we have commercial interest in your innovation, we’ll work hard to help get your technology licensed, obtain a sponsored research agreement or both. We will be mindful of disclosing your inventions thoughtfully so as to preserve confidentiality, both to protect your work and to safeguard any IP rights. Don’t forget to make sure any presentations or discussions of your innovations are under confidentiality, and don’t hesitate to talk to us if you aren’t sure if you need a confidentiality agreement. UCSF offers a variety of licenses and agreements to handle the transfer of our technologies to the market place. Exclusive licenses grant a single external partner the right to commercialize an invention in a particular market segment or “field of use.” Exclusive licenses are typically granted for technologies requiring substantial financial input from a partner to bring the technology to the market and where exclusivity in that market is necessary to recuperate the financial investment, such as a patented therapeutic. Non-exclusive licenses provide multiple external partners the rights to commercialize the same invention. Such licenses are typically granted for research tools, software, screening assays and some diagnostics. Non-exclusive licenses enable maximum public benefit by permitting broad access. Option agreements provide one or more external partners a specified, limited time to evaluate a technology before entering into a full license agreement. LOIs are simple, short-term agreements that enable UCSF to exclusively reserve a technology for an external partner while the parties negotiate the terms of an exclusive license or an option agreement. In return for taking the technology off the market, the external partner pays a fee and, if the technology is protected by patent rights, the partner covers patent expenses for the duration of the LOI. As govern UCSF’s relationships with joint intellectual property owners. MTAs govern the transfer of material or data into and out of UCSF.